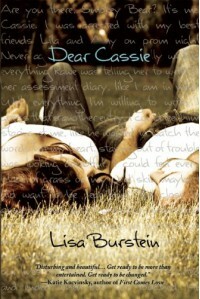 Note : Dear Cassie is a companion/follow-up to the book [b:Pretty Amy|13375237|Pretty Amy (Pretty Amy, #1)|Lisa Burstein|http://d.gr-assets.com/books/1330899178s/13375237.jpg|18604904]. I hadn't read PA first and got along fine without having read it, but there was one situation carried over from PA which was never fully recapped and I'd liked to have known more about that situation.This could possibly be top 5 for endings which have made me say : wait, what?There was no cliffhanger, and I wouldn't even really call this an open ending. In a sense the ending was good enough. Ben's stunt was ridiculous but it was also a definite attention-getter! However, what happened after the stunt...it was just...ODD. Pleasantly odd, but still odd.2.5 stars. As far as "issues" or "troubled teen" books go, this wasn't a standout for me and I've read better. If you're looking for a John Green type of cry-fest, you won't find it here. I failed to get emotional about much of anything. BUT - there is a BUT here. It appears that everyone else is loving this book but me. There is a good message at the heart of the matter and the message is this :You need to forgive yourself.Cassie has lived through a lot and you can tell that she made some decisions without really thinking through how they would have an effect on her in the end, so she's suffering regrets after the fact.This is not technically a love story, so don't be fooled by the cover. While there is a love interest and a budding romance, the point is not about Cassie finding love with another person - it's about her learning to love herself again. In a way, I think that was the best part of the story. I liked how the romantic lead was there merely for support and not used as a crutch or as the reason for Cassie's road to recovery. Ben really was a wonderful character. He was patient, funny, and honest. If you like to read books in which a character learns more about themselves as they recover from a rough patch in their life, then you'll probably get more out of the book than I did. Sometimes, quiet reflections and lessons learned make for an absorbing read and there are definitely people who will appreciate what the author is doing here.What didn't work for me was the camp dynamic. I thought there could have been crazier happenings at the camp if it was going to take so long for Cassie to get to a point where she was willing to open up and examine herself. A lot of what happened for a good portion of the book was of absolutely no interest to me. The following isn't even a complaint but more of an observation. The chapter headings having the f word in them was kind of ridiculous. Yes, most of us swear. Some of us swear a lot. But I always feel like books are trying too hard to be edgy when we're hit over the head with the language in a way that feels forced or positioned. Conversational words feel more natural. Chapter headings - not so much. Was this worth the read? I don't have any regrets but I can't say that I'll be pondering this book days after the fact, which is what I tend to look for when I read an issues book. Surprisingly, I went through a similar situation as Cassie, but our outcomes were different. Even though Dear Cassie didn't really push any of my emotional buttons, there were still plenty of lovely and thoughtful moments inside. If the synopsis appeals to you, I say to give it a shot because you might be on the side of all the people who fell in love with the book. "I think I can make you happy," he said, his eyes on the sky. "I also think you're funny as hell. ""Thanks," I said, "but I'm pretty sure I've never been happy.""Exactly. "Totally random, but the first book I wrote (which will probably never see the light of day) has lead characters named Ben and Cassie. :pThis book provided from the publisher through Netgalley in exchange for an honest review. All quotes are from the pre-published copy and may be altered or omitted from the final copy.